Abdollahi, A., Haeri, H., Alaie Alamooti, A. (2010). Giant Submucosal Lipoma of Sigmoid Colon. Iranian Journal of Pathology, 5(1), 40-42. Alireza Abdollahi; Hayedeh Haeri; Alireza Alaie Alamooti. "Giant Submucosal Lipoma of Sigmoid Colon". 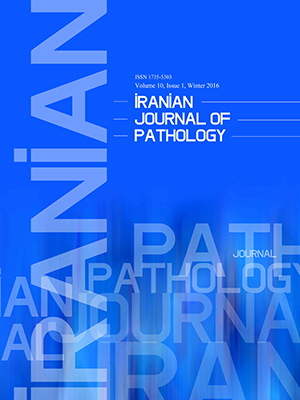 Iranian Journal of Pathology, 5, 1, 2010, 40-42. Abdollahi, A., Haeri, H., Alaie Alamooti, A. (2010). 'Giant Submucosal Lipoma of Sigmoid Colon', Iranian Journal of Pathology, 5(1), pp. 40-42. Abdollahi, A., Haeri, H., Alaie Alamooti, A. Giant Submucosal Lipoma of Sigmoid Colon. Iranian Journal of Pathology, 2010; 5(1): 40-42. Lipomas of the gasterointestinal Tract are relatively uncommon in clinical practice. Most cases are asymptomatic with small tumor size and do not need any special treatment but the large ones are known to cause symptoms such as abdominal pain, obstruction, intussusceptions, and bleeding. The majority (90%) of these lesions are submucosal with predominantly right sided with a slight preponderance in females. Recurrence or malignant transformation has not documented in these lesions. We present a case of giant submucosal lipoma in a 33 years old male in sigmoid colon presenting with abdominal pain and rectal bleeding from Imam Hospitals’ complex, Tehran-Iran. In patients with gastrointestinal symptoms and large mass in sigmoid and with non-specific findings in colonoscopy, this disease has to be taken into consideration.